Which Superhero show had the best season finale? The CW managed to create a comic book live action universe that rivals the MCU. 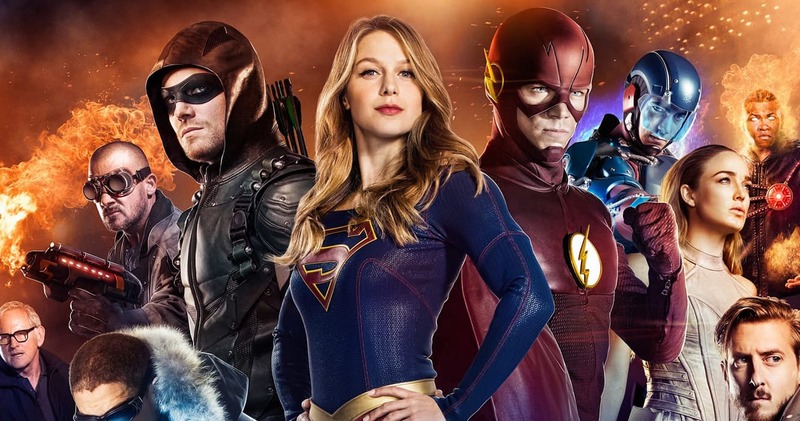 And with the seasons finales of The Flash, Arrow, Supergirl and Legends of Tomorrow finally aired, I’ll look back on which show had the best finale and which haven’t. Let’s start with Arrow, perhaps the best show to respond to criticism, I’ve honestly didn’t expect them to come back from the catastrophe that was season 4 but they did. And season five easily became one of my favorites. The finale had just the right amount of classic action scenes and emotional impact. The long-awaited Talia and Nyssa fight was epic but sadly short, but it was fathomable since the episode had too much going on. Stephen Amell delivers his best performance on the show yet. The phone call between him and Susanna Thompson who used to play his mom was heart wrenching, and very well acted. Towards the end of the episode where Oliver manages to get his son it almost feels too good to be true but then the cliffhanger happened, the island was blown off. It’s a perfect opportunity to get rid of some of the secondary characters since it felt kind of a crowded season, but we know for a certain that characters like Dig, Felicity, Thea and Laurel are safe. The winner of the best scene though was definitely Oliver racing through the island trying to catch up with the boat, the end result with him in the perfect position looking the same way he looked in season one hit me hard, it was the perfect tight up, and it’s what makes this season so great. What I would like to see in the upcoming season is hopefully less new arrow members and more villains. The video Oliver showed Thea hints at her probably returning to watch over her brother in the next season, but we don’t know what kind of impact Merlin’s passing will cause her. I would love to see more of Diggle and Lyla, they have the best chemistry on the show. The unfinished plot between Felicity and helix is also very intriguing, it would be a shame not to be explored more. And while Black Siren was a great villain on both The Flash and Arrow, I can’t help but miss the old Laurel. It was a bold and frankly a stupid decision to kill The Black canary on a Green Arrow tv show, but I hope they can somehow redeem that mistake. Overall this season was one of if not the best of the entire show’s run. It gave us everything we wanted, a good villain, epic action scenes and best of all it gave us the old arrow feels that made us fall in love with this show back in season one and two. There’s moments where I loved the Flash finale and there’s moments where I hated it. While Arrow’s cliffhanger felt on point the one in flash felt forced and useless. It was going well for the team, they got rid of Barry’s evil time remnant, thank you Iris West, and were celebrating but then Barry got sucked up into the speed force. Did he deserve some punishment for flashpoint? Yes. Did Iris West deserve to lose Barry again after she was finally ready to be Iris West- Allen? No. The part that left me confused is why was Killerfrost was okay with aiding evil Barry and hell bent on destroying her team, and what did he offer her in return. I loved that she didn’t get rid of her powers but she has what appeared to be control over her actions. What I loved the most about the episode was that Iris was the one who saved Barry. Iris West was called the most useless character by some fans for some time now, and it’s nice to have her so involved in the show without undermining the Flash but with giving her the true respect and purpose for being in the show. If there’s one thing I like in the Flash more than Arrow is their writing of female characters. I would like to see Iris venture more into journalism like she did earlier. There’s no way to predict what’s going to happen next, but I would like for Julian and Tracy to be back. Overall it wasn’t that bad, but I hold The Flash in a higher regard. When it first started it surpassed even Arrow, but unfortunately not this season. This season of Legends of Tomorrow was undeniably shoddier than the first one, and perhaps it’s the villains fault. Legends already felt like a show to take in Arrow and the flash stray characters and nothing more, but it surprisingly worked. The constant links and connection between the other shows is impressive, I liked the bit about Sara telling Nyssa’s father about Lian Yu and then Nyssa telling Oliver in Arrow about how her father told her to go there, and it was there where she found Sara. Captain Cold was missed through the season, but we did get to see more of him. The finale combined breaking every rule Rip Hunter set for his former team, and just when you thought they were off the hook and the world was saved it turned out that they broke it instead. What I love about this show is how they can combine a high level of humor through a dark plot, we literally saw every member die, and that’s the magic of a superhero show. The finale battle wasn’t as exciting as the season one finale with Savage especially since Thawne was finally caught. He is the only villain that I would like to see return, and not only because he warned us that the Flash is the villain of the season. It would be interesting if Sara managed to find another way to bring her sister back to life, it will certainly create a big wave on arrow with Siren already there. Overall the finale was good enough for the buildup, I would like for them to face a more original villain like Savage, and have less strays from the other shows. Now onto Supergirl, we’re only two seasons in but we certainly see some downgrades from the first one. Cat Grant for example is immensely missed, she added just the right amount of humor and snark to the show that no one was able to replicate. The addition of Maggie was a great one, I would have loved to see more of her than just her relationship with Alex. Best new character goes to Lena Luthor who was unpredictable and very charismatic, I loved her chemistry with Kara. The crimes that were done to Jimmy Olsen’s character were too many to count. Seeing Mon-El go but not dead was the best direction for his character, because nobody can’t have everything, not even heroes. The possible arrival of a new Kryptonian or an Alien in a pod felt a little overused, but the shock of Lex Luthor’s machine modified by Lena eventually saving the world was a good touch. Overall Supergirl had a rough season but the finale was better than expected.